This is a 3 channel variant of the Guard Dog “low profile” range of cable protectors. It has a lower profile yet is still strong, durable and able to withstand heavily loaded vehicles and foot traffic. The lower profile of this ramp makes it ideal for areas with heavy foot traffic. There is a wheelchair friendly variant available which can also be selected above. The wheelchair friendly version has less steep ramps and is easier to pass over for those on mobility scooters and wheelchairs. Both styles of ramp (low profile standard and wheelchair friendly) can be used together to create crossing points for wheelchair users where needed. The ramps can take loads of up to 15,422kg per axle for the standard profile and 24,492kg per axle for the wheelchair option. Cables of up to 19mm (.75”) external diameter can be accommodated with ease as each channel is wider than it is tall. Need assistance getting the right low profile ramp? 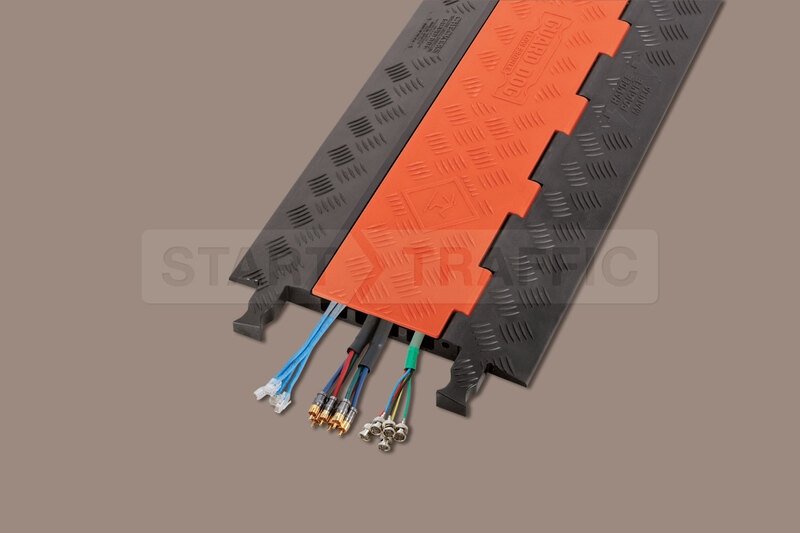 Give our sales team a call on 01905 794 875 to discuss our range of cable ramps. Our sales team will ensure you get the best deal and correct ramp for the application.